The Irish Wolfhound has a remarkable history, but it is difficult to separate truth from fiction and they appear in many Irish legends and fables. It is believed that these dogs were originally used by the Celts in wars to drag soldiers from chariots and horseback. Irish Wolfhounds came to Ireland when the Celts migrated from Eastern Europe. Throughout history they were also used for hunting wolves and Irish elk and were held in such high esteem they were sometimes given as prestigious gifts to noblemen and kings. By the time of the great famine in Ireland in 1840, this breed had all but died out, there being no wolves left in Ireland. An Army Captain, George Augustus Graham worked to revive the breed by collecting what he thought were the last specimens and breeding them with Great Danes, Deerhounds and Borzois. He founded the Irish Wolfhound Club in 1885. Today, Irish Wolfhounds are seldom used for their original purpose of hunting. They are a treasured family companion that successfully competes in obedience and lure coursing. 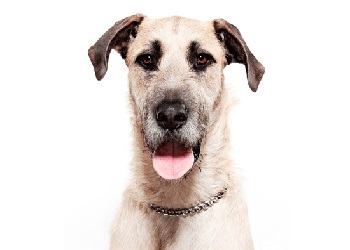 Irish Wolfhounds are good natured and easy going dogs and they bond strongly with humans. They are calm and dignified but can be standoffish with strangers. They are the tallest of all dogs (by minimum breed standard) – their sheer size is a deterrent to potential intruders rather than by behaving aggressively. Because these dogs are sight-dogs, they still retain the instinct to chase. They need to be well-controlled around livestock and should always be walked on a lead and collar or check chain. It is essential to train them to walk calmly beside you when the dogs are young and biddable. Although quite trainable, they do not enjoy repetitive obedience routines. It is also best to use the word ‘gently’ to encourage them to be careful around children and smaller pets. It is not recommended to encourage giant breed dogs to jump up on people or play rough – an adult male may weigh more than 85-90 kilos and could easily knock a person over. Irish Wolfhounds have a dual coat – rough and shaggy on the outside and soft underneath. They need brushing three to four times a week and a regular bath. They shed all year round, but brushing will help to get rid of this excess hair. These giant breeds need regular exercise, such as a daily walk. Vigorous exercise is not recommended until they are around 9 to 12 months of age. Like all dogs, Irish Wolfhounds require regular tick, flea, intestinal worms and heartworm treatment. Please talk to your vet on treatment options. Desexing and vaccination against diseases, such as the parvo virus and infectious canine cough, are also important to discuss with your vet and essential before taking your dog out in the street when a young puppy. Irish Wolfhound Clubs also advise puppy owners to ensure their dog comes from a breeder that has checked for portosystemic shunt (PSS), an often fatal liver problem. Irish Wolfhounds suit many types of owners, although because of their size they are usually recommended for experienced dog owners, as they are more difficult to rear successfully than smaller breeds. These dogs develop a close affinity with people and are generally very tolerant with children – but, like with all dogs, remember never to leave them unsupervised. Irish Wolfhounds like to spend time indoors, wherever their family are. However, if you do not want them to get on the lounge when fully grown do not encourage them when they are puppies. It is a good idea to have a special place inside the house for your dog on his own mat or rug. They are not suitable for apartment living. Outside they need space to romp and play. A well-fenced yard is a must for this breed and they need a good walk (at least 30 minutes) daily when grown. Irish Wolfhounds are generally compatible with other dogs, but because they love to hunt and chase, other pets (e.g. cats and rabbits especially) can be considered fair game, so best to introduce them when puppies to other pets in your house. Common hereditary problems Portosytemic shunt, heart disease, bloat, bone cancer, eye problems and elbow and hip dysplasia.